LEAD JUDGMENT: MUSA DATTIJO MUHAMMAD, J.S.C. This appeal borders on Electoral Matters. This is an appeal against the judgment of the Court of Appeal, Abuja Division, upturning the decision of the Federal High Court, Abuja. The first Respondent had, on the 1st of November, 2014, conducted ward congresses in all the wards of the State, in which three delegates were elected from each ward. The delegates so elected were saddled with the responsibility of voting in the primary election fixed for 8th December, 2014 in order to elect the 1st Respondent’s candidate for the Governorship Election in Enugu State. When an issue arose as to the 1st Respondent’s commitment to utilizing the list of the delegates, some delegates proceeded to the Federal High Court and initiated an action. In his judgment, Ademola J. sanctioned and or recognized the list submitted by the plaintiffs as the authentic delegates to the primary election. ​The National Working Committee of the Respondent appointed a panel under the leadership of His Royal Highness King Asara A. Asara, to conduct the primary election of 8th December, 2014. The Appellant refused to participate in the primary election conducted by H.R.H Asara A Asara, on the ground that the list submitted for the primary election which was in possession of King Asara A. Asara deviated from his own. It was his claim that a parallel primary election, in which the list of delegates sanctioned by the Federal High Court was used in conducting the election, had elected him as the Governorship candidate of the 1st Respondent. The Appellant therefore did not participate in the primary election organized by the panel that was appointed by the 1st and 2nd Respondents, in which the 4th respondent emerged the winner. The appellant proceeded to the trial Court, via an originating summons, against the respondents, and claimed some declaratory and injunctive reliefs. Parties filed and exchanged pleadings. The 4th respondent filed a preliminary objection to the originating summons, questioning the locus standi of the appellant to institute the action. 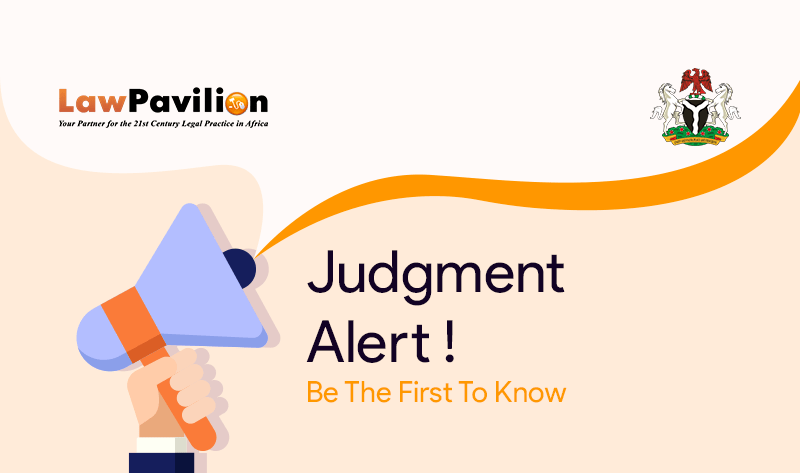 Arguments in respect of the preliminary objections and the substantive suit were heard together by the trial Court which, in a considered judgment, overruled the preliminary objections, assumed jurisdiction and dismissed appellant’s suit it adjudged unmeritorious. Dissatisfied with the trial Court’s dismissal of his suit on the merit, the appellant appealed to the Court of Appeal in appeal no. CA/A/157/2015. Equally aggrieved, the 1st, 2nd and 4th respondents appealed against the trial Court’s assumption of jurisdiction over appellant’s suit. The Court of Appeal considered the appeals separately and affirmed the trial Court’s finding that the appellant had failed to prove his case and dismissed same. The Court allowed respondents’ appeals and struck out the suit at the trial Court having been commenced by the appellant who was lacking the necessary locus standi. Aggrieved, appellant appealed to the Supreme Court. In conclusion, the appeal was dismissed. “The appellant’s complaint relates to the primary election conducted by his party (PDP) on 8th December 2014 to select its candidate for the Governorship Election of Enugu State in the 2015 general elections, in which the 4th respondent was returned as the winner. He contends that his claim falls within the purview of Section 87 (9) of the Electoral Act 2010, as amended. This Court has held in several cases that ordinarily, matters relating to the selection and nomination of candidates for an election are within the sole preserve of the political party and the Courts have no jurisdiction to look into any complaint arising thereform. See: Onuoha vs Okafor (1983) SCNLR 244: Dalhatu VS Turaki (2003) 15 NWLR (Pt. 843) 310; Agi vs P.D.P (2017) 17 NWLR (Pt.1595) 386. However, Section 87 (9) of the Electoral Act 2010, as amended gives the Courts very limited jurisdiction to ensure that in the selection or nomination process, political parties do not act arbitrarily but within the confines of their Constitution and Electoral Guidelines and in accordance with the provisions of the Electoral Act. Section 87 (9) of the Act provides a window for an aspirant who complains that any of the provisions of the electoral Act or his party’s guidelines have not been complied with in the selection or nomination of the party’s candidate for the election, to ventilate his grievance before the Federal High Court, a State High Court or the High Court of the FCT. Not only must his complaint relate to non-compliance with the Act or his party’s Guidelines, he must also bring himself within the purview of the sub-section by showing that he was an aspirant in the election complained of. Who is an aspirant? An aspirant is a person who contested the primary election of his party. He must be someone who actually participated in the primary election he is challenging. See: P.D.P Vs Sylva (2012) 13 NWLR (Pt.1316) 85 @ 126 A-E; Lado vs. C.P.C (2011) 18 NWLR (Pt.1279) 689: Shinkafi vs. Yari (2016) 7 NWLR (Pt.1511) 340. What is more, the primary election he is complaining about must have been conducted by the National Executive Committee or National Working Committee of the party. See: Emenike vs P.D.P & Ors (2012) 12 NWLR (Pt.279) 689: NWLR (Pt. 1448) 123 @ 198 A-H.
Off Agbaoku Street, Allen Avenue, Ikeja. Lagos. NG - 100216.